I recently asked readers to describe where they were in their spiritual journey. The answers were widely varied. Some were just starting on the journey to know and follow God. Many had fallen off the path and were trying to find their way to back. Others were devoted followers and deeply faithful, yet still committed to growing in their faith. No matter the starting place, though, each answer had a common theme. Each had a desire to grow spiritually and take a step further in that journey to know and follow God. So, if you really want to take steps in your faith journey and grow closer to God, why not be focused and purposeful about setting spiritual growth goals? Do You Want to Grow Your Faith? Decide for yourself – do you want to grow in your faith this year? Do you want to discover all God has planned for you? Do you want to tap into the power that comes from faith – the peace, joy, and hope that surpasses all understanding? If so, set a spiritual growth goal along with your other resolutions for the year. Keep reading and we’ll dive into how to grow spiritually and how to set goals to help you grow ever closer to God and God’s possibilities for your life. Let’s start by defining spiritual growth. What does it mean to grow spiritually? When you decide to accept Jesus and believe in God, that’s only the beginning of your faith journey. You’re like an infant in the faith, beginning to open your eyes to see, your ears to hear, and your heart to know God. However, there is still much to be revealed and understood. You’ll only uncover the deeper layers and meanings of faith if you intentionally seek to know God more and align your life with his plans for you. This means diving deeper into prayer and Scripture, serving others, getting involved in a Christian community, and exploring other spiritual disciplines. Spiritual growth is the life-long pursuit to know Jesus more deeply and to live a life that fully reflects him to the world. Why Set Spiritual Growth Goals? If you want to grow in your faith and discover all of God’s possibilities for your life, set goals for spiritual growth to help you stay focused. Following God’s path is the narrow road, the more difficult road in life. You won’t take this road by accident. You’ll only find this road and stay on it through intentionally seeking through prayer, Scripture, and desiring to grow in your faith. Spiritual growth comes from intentionally seeking God through prayer, Bible study, and aligning your life to God’s desires for you. Your first spiritual growth goal should be to make your faith a priority. Be purposeful and intentional about growing your faith. Make a plan and set incremental steps you can reach. Hold yourself accountable for making progress on your plan. Be prayerful about setting spiritual growth goals, asking God where you need to grow this year. Do you need to grow your prayer life and develop a daily prayer habit? Do you need to get deeper into God’s Word, reading and studying the Bible more? Do you need to connect with others in a community of faith? Do you need to find opportunities to serve others? If you’re still not sure, start with small steps to deepen your prayers, read the Bible, and get involved in a church community. Prayer is essential for spiritual growth. This is how we engage in conversation with God, sharing our hearts and listening for His response. Schedule time in your day to pray and make it a habit. Start small and build up the time you spend in prayer. If you need guidance in your prayer, try the (free) Pray As You Go app. This leads you through a time of prayer, focusing on a daily scripture and reflection. 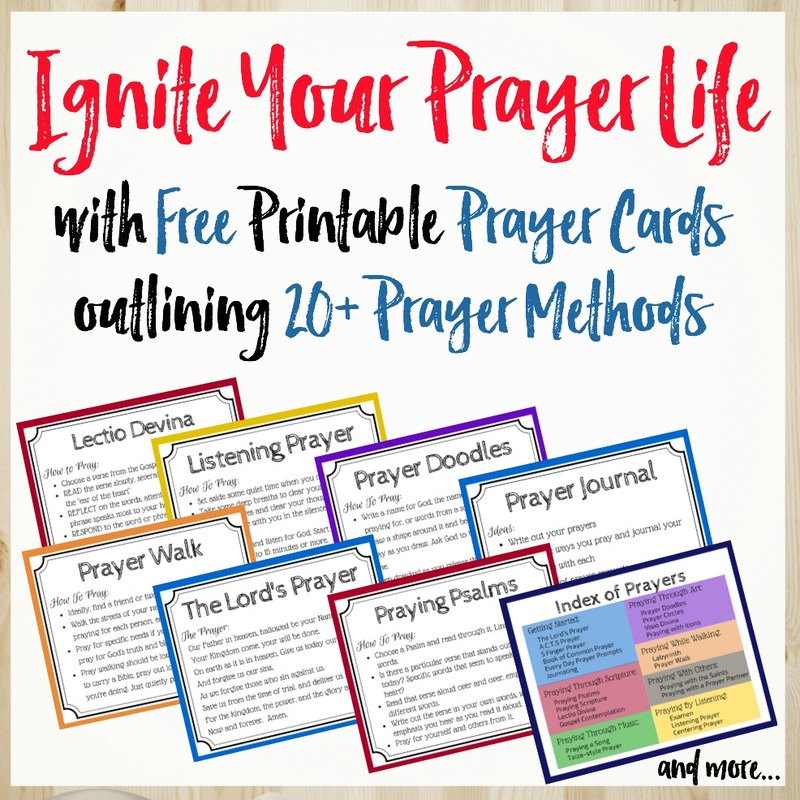 Or, if you need ideas on how to pray, get my new Prayer Toolbox here, a resource with more than 50 ideas to inspire your prayers. If you want to hear God’s voice in your life, start with “hello” and open the conversation. Start today with a prayer to re-introduce yourself to God and ask Him to speak into your life. Next, commit to 5 minutes a day of prayer, working up to more and more as you build your prayer muscle. Hold yourself accountable for spending time with God each day. The more time you spend in God’s presence, the deeper your relationship will grow. If you want to grow closer to God, you need to get into His Word. Don’t settle for someone else’s summary or interpretation. Get into the Word for yourself and allow God to speak directly into your heart. Devotionals, Bible studies, and sermons are good, but there’s no substitute for reading the pages of the Bible for yourself. If you’d like to follow a reading plan, look at Biblegateway.com.They have a number of (free) reading plans available. If you want to read the Bible, start with one chapter. If you’ve tried before and always seem to give up when you hit Leviticus, try a different reading plan. Start with the New Testament or choose one that has a reading from the Old Testament, Psalms, and the New Testament, so you have some variety. Make a plan, but don’t give up just because you get busy and fall behind. Pick up where you left off and keep going. Faith is best lived and developed in community, so make sure you’re plugged into a vibrant community of faith. How can you get more involved in your church or find a church home if you don’t currently have one? Ideally get involved with a real-life faith community and make relationships in person. However, if you’re not physically able to get to church or can’t find an encouraging faith community nearby, find a community online. If you want to get plugged into a church community, start by getting up on Sunday morning and going to church. If you don’t have a church home, choose a church to visit next Sunday. Maybe the first one won’t be the right fit. Visiting churches might not feel comfortable. It may take all you have to just to walk in the door. But, choose a church to visit and take the first step anyway. Then, set some next steps to keep visiting until you choose a church home. After that, set incremental goals to get involved: become a member, join a small group, make 5 new friends, and so on. How Will Your Grow Your Faith This Year? Results are hard to predict for a goal like spiritual growth, but if you commit to taking these four steps, you’ll be changed. When we enter into a relationship with God and commit to spending time with Him, He’ll begin to do real work in our hearts and bring about real transformation. Are you ready to get started? What first step will you take this week? Arabah Joy’s Grace Goals is a fantastic program to help you set goals for your life – for spiritual growth or other personal goals (losing weight, preparing for a race, career goals, etc.). This goal-setting program is Biblically-based, helping you align your goals and dreams with God’s plans for your life. What exactly is Grace Goals? Grace Goals is a totally unique goal-setting process that lays the spiritual foundation necessary for real transformation in your life. Through a series of step-by-step workshops and exercises, Grace Goals will show you how to work in conjunction with the Spirit of God to fulfill the desires He’s placed in your heart. It’s a biblical process for total life transformation. I’ve used Grace Goals and can attest to the power of this program to define the right goals and ensure they’re aligned with God’s plans for me. It’s helped me better discern the right goals to set and stay on track. Click here to learn more about Grace Goals and how it can help you set goals that will bring true transformation to your life! Great tips for those looking to get started with spiritual growth! I especially love your comments about reading your Bible. There is no right or wrong way to start! These are very practical tips, Kathryn. Thanks for sharing on Grace and Truth. These are such practical tips, Kathryn. Thanks for sharing on Grace and truth.